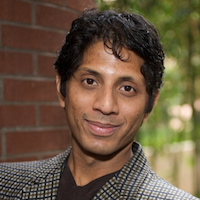 Shrikanth Narayanan received his M.S., Engineer, and Ph.D., all in electrical engineering, from UCLA in 1990, 1992, and 1995, respectively. From 1995-2000 he was with AT&T Labs-Research, Florham Park and AT&T Bell Labs, Murray Hill--first as a Senior Member and later as a Principal member of its Technical Staff. Currently, he is the Niki & C. L. Max Nikias Chair in Engineering, and a Professor in the Signal and Image Processing Institute of USC's Electrical Engineering department and holds joint appointments as Professor in Computer Science, Linguistics, Psychology, Neuroscience and Pediatrics. He is also the inaugural director of the Ming Hsieh Institute at USC, and a Research Director for the Information Sciences Institute. He was a Research Area Director of the Integrated Media Systems Center, an NSF Engineering Research Center at USC, and was the Research Principal for the USC Pratt and Whitney Institute for Collaborative Engineering, a unique partnership between academia and industry (2003-2007). Shri Narayanan is currently Editor-in-Chief for the IEEE Journal of Selected Topics in Signal Processing and an Editor for the Computer, Speech and Language Journal and an Associate Editor for the APSIPA Transactions on Signal and Information Processing, having previously served an Associate Editor for the IEEE Transactions of Speech and Audio Processing (2000-2004), the IEEE Signal Processing Magazine (2005-2008), the IEEE Transactions on Multimedia (2008-2012), IEEE Transactions on Signal and Information Processing over Networks (2014-2015), the IEEE Transactions on Affective Computing (2010-2016) and and the Journal of Acoustical Society of America (2009-2016). He holds or has held positions on the Speech Communication and Acoustic Standards committees of the Acoustical Society of America and the Advisory Council of the International Speech Communication Association, the BigData SIG (2014-present) the Speech Processing Technical Committee (2003-2007) and on the Multimedia Signal Processing technical committee (2005-2008; 2014-present) of the IEEE Signal Processing Society. At USC, he was Chair of the Joint Provost-Senate University Research Committee (2006-09) and, a Past President of the Phi Kappa Phi Academic Honor Society (2007-08). Shri Narayanan is a Fellow of the National Academy of Inventors (NAI), the Acoustical Society of America (ASA), the Institute of Electrical and Electronics Engineers (IEEE), the International Speech Communication Association (ISCA), the Association for Psychological Science (APS) and the American Association for the Advancement of Science (AAAS). He is a member of Tau Beta Pi, Phi Kappa Phi and Eta Kappa Nu. He held the inaugural Viterbi Professorship in Engineering at USC (2007-2016). He is a recipient of an NSF CAREER award, USC Engineering Junior and Senior Research Awards and Use-inspired research award, USC Electrical Engineering Northrop-Grumman Research award, a Mellon award for mentoring excellence, a USC Distinguished Faculty Service Award, an Okawa Research Award, IBM Faculty Awards (2008, 2010), Google Faculty Research Award (2016), the 2011 UCLA Engineering Alumni Professional Achievement Award, and a faculty fellowship from the USC Center for Interdisciplinary research. He is a recipient of a 2018 ISCA Best Journal Paper Award (with Ming Li and Kyu Han), an Engineer's Council 2015 Distinguished Engineering Educator Award, a Ten Year Technical Impact Award from the 2014 ACM ICMI, a 2009 Best Transactions Paper award (with Chul Min Lee) and a 2005 Best Transactions Paper Award (with Alexandros Potamianos) from the IEEE Signal Processing society and was selected as Signal Processing Society Distinguished Lecturer for 2010-2011, the International Speech Communication Association (ISCA) Distinguished Lecturer for 2015-16, and the 2017 Willard R. Zemlin Memorial Lecturer for American Speech and Hearing Association (ASHA). Papers co-authored with his students have won awards at ACM-AVEC 2018 Emotion Gold-standard Subchallenge, Interspeech 2016, ICASSP 2016, Interspeech2015-Nativeness Challenge, Interspeech2014-Cognitive Load Challenge, Interspeech2013-Paralinguistics Challenge, Interspeech 2013, Interspeech2012-Speaker Trait Challenge, Interspeech2011-Speaker State Challenge, InterSpeech 2010, InterSpeech 2009-Emotion Challenge, IEEE DCOSS 2009, IEEE MMSP 2007, IEEE MMSP 2006, ICASSP 2005 and ICSLP 2002. His research interests are in signals and systems modeling with an interdisciplinary emphasis on speech, audio, language, multimodal and biomedical problems and applications with direct societal relevance. His laboratory is supported by federal (NSF, NIH, DARPA, IARPA, ONR, Army and DHS) and industry grants. He has published over 750 papers and has 17 granted U.S. patents.